The 20th Anniversary edition of A GAME OF THRONES, with all of its gorgeous art, is now on sale everywhere, I'm pleased to say. You should be able to find it at your local bookstore, if you're one of the folks who is lucky enough to have a local bookstore. If not, it is of course available from all the usual online booksellers. Or any one of hundreds of independent bookstores or B&N outlets. Just find your favorite. I had a look inside the book the other day, it was fantastic! What are you doing to celebrate George? Got mine in the mail yesterday and I love the art. Jon, Ghost, and Tyrion up on the Wall and Dany hatching her eggs are my favorites so far. Much appreciated, keep em coming! It's to be delivered tomorrow. I cannot wait! I pre ordered it a few weeks ago, I can't wait ! Thank you for this treat ! I'm excited about adding this to the collection. I was curious: have you entertained the possibility of doing more anthology/novella work in the future -- maybe a new DUNK AND EGG, a previously-unpublished chapter from FIRE AND BLOOD or something that hasn't been previously released for THE WINDS OF WINTER? Hey, George. I know this is pretty off-topic, but I was curious to hear what you think of the news that Tolkien's Tale of Beren and Luthien will be getting a new edit/release? I know you have great respect for Tolkien. I personally am very excited. What a beautiful way to celebrate this epic journey's 20th birthday! 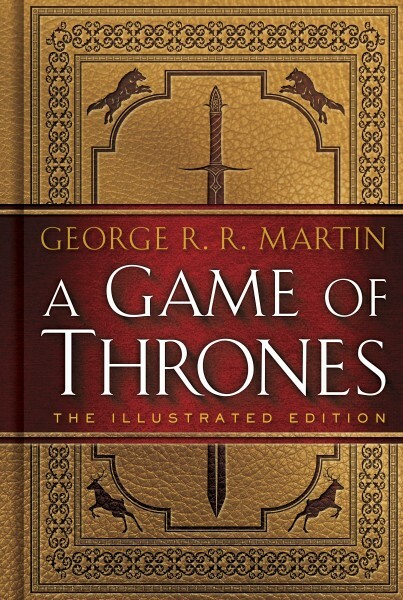 Hello Mr. Martin, I just recieve my illustrated book, page 648, Joffrey is miscut. I was wondering if it was a printing error or I was just unlucky??? I think you were just unlucky. We have not received any other reports of a problem. Take the book back to wherever you bought it, and you should be able to exchange it for a good copy. there have been idiotic rumors on the internet during the last week claiming that you have lost your manuscript for TWOW, and that due to this the book will either hit the shelves in no less than two years from now or that it will never be published at all. Since this is first and foremost bad advertising with respect to your great talent, could you reassure us that your work is going on as usual? Such web pages should be banned! It does get wearisome having to endlessly deny this stuff. Take your time George. The length and content deseve it. You are a master. I will only be disappointed when the last word is read. But then I get to do it again! I bought my copy two days ago. I was going to wait until it trickled down to the used book stores. But was persuaded to get it once I saw the art work (and the 40% off the cover helped as well). Some of the artwork is from the art books/gaming cards as well as the calendars, but other work is completely new. For some reason I actually find the images very complimentary to the story and it doesn't feel like a money grab. I also like the fact that they used a new type setting or font, and I like the feel of the paper. The book has a nice heft to it and feels nice in my hand.